A few days ago I tested Tweet Lanes for you, and over the last few months we've reviewed a number of third party Twitter apps. 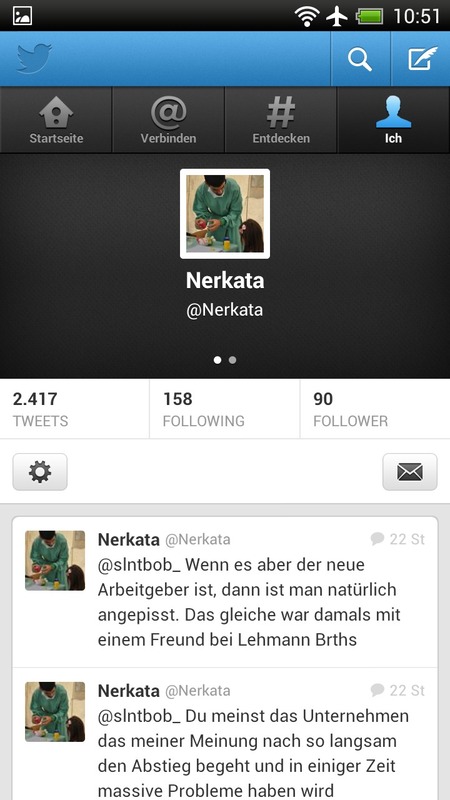 So it's only natural that I felt an urge to revisit the official Twitter for Android app. If you're curious to see what we make of it just keep reading. If some of our readers have been following Twitter politics in regards to third party apps read on, because we have been greedily keeping up with this polemic. In the last weeks Twitter has been undergoing a perilous paradigm shift: apps such as Boid, Tweet Lanes or TweetBot (for iOS) have been limited to a certain amount of call via API. Furthermore, third party apps must adhere to standard design laws. The reason I labeled this shift as being “perilous” is because it is precisely thanks to these third party apps that Twitter can today enjoy the kind of success and following it has garnered. By parting ways with said clients the stock Twitter app is more or less forced to change gears and rocket into stellar level. I've been using Plume and Boid mostly of late, and the first thing that struck me working with the official Twitter app is the prevalence of “sponsored posts”. Ads are meant to hit home, and thanks to these posts they do. Twitter for Android comes with a lot of functions we users are looking for: auto-complete for user names and hashtags, for instance. What's missing are clearly the various filter functions. Why, for instance, can't users block certain hashtags? That would save a long roundabout way of blocking out information you don't want or need. On the bright side, various essential features – Retweets, responding and writing posts – are easy to do and feel intuitive. What feels a lot less intuitive, on the other hand, is the confusing manner in which options are displayed. You're meant to be able to access them by swiping a Tweet—but this does not always work and just feels messy. Aside from these drawbacks the official Twitter app is a solid one. No big surprised, no wow-effect, but good, dependable functions such as we would expect from any half-decent Twitter app. Twitter for Android comes with all of the features on might expect from a Twitter app and as far as functionality goes we can recommend this app. As far as intuitive navigation, controls and even design are concerned, there's still room for improvement. After the last major update, there have been a few changes to the official Twitter app. It has now established itself as a default app. Despite various cuts, the app is still worth recommending. 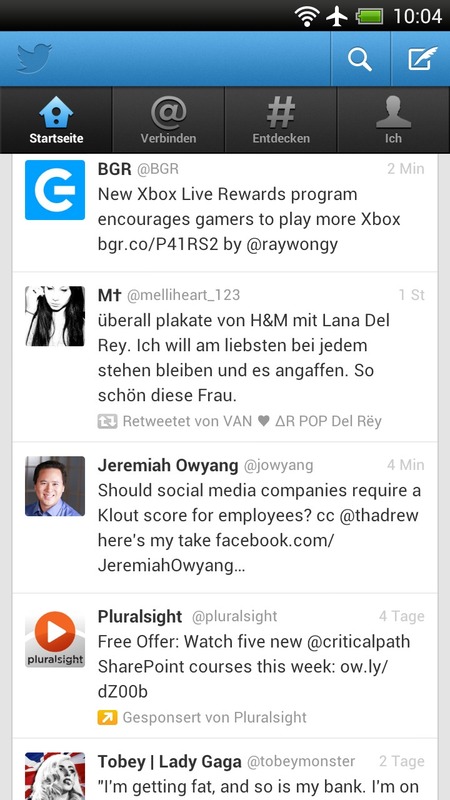 One of the unique features is the interactions in the ''mention'' column. This shows the users quickly which tweets are spreading via re-tweet and whether they have followers. These interactions are really good and the rest of the functions are basically the same. Almost all of the functions can be operated like some found in TweetCaster, but the content consumption is better managed. The only problem is the lack of individuality in the app where you could arrange certain features to your liking. All in all, it still leaves me with a good impression. The biggest news, however, can be found in the next category. Note: It wasn't possible to upload mobile photos with the Nexus 4. Tweets were also published at irregular intervals and ''wandered'' accross the screen. This improved though since the last update. 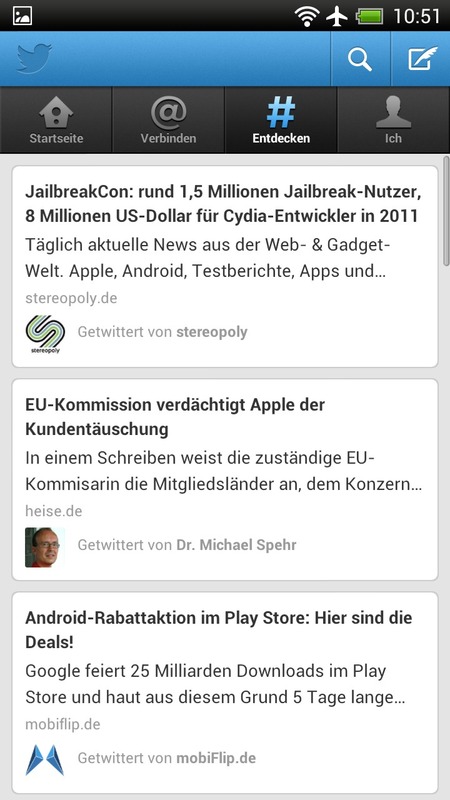 Twitter for Android falls somewhat short in this category. This comes down to the regular re-designs which bring with them pros and cons. Though Twitter strives to maintain its aesthetic, but this does not necessarily translate into an interface that has been adapted for the Android platform. The Twitter devs seem to be wholly unfamiliar with or happy to ignore the Holo design. The overall look is strongly reminiscent of iOS rather than Android. The user also has to cope with lacking individual adaptations of tabs and functions. For instance, I can't quite work out why on earth instant messages can't be packed into the overhead tab. For the functional point of view, it remains the same. But there has been a lot of change to the graphics and use. The interface has now adopted the Android look and has become a lot better. The operation has also improved and can be altered with swipe gestures in the individual categories. The multi-user function has been changed for the worst and it would have been great if it had incorporated more ''Carbon''-like gestures. The developers have managed to take Twitter a few steps forward in terms of graphics, except for the missing configuration buttons and the weird placing of many functions, like the settings and direct messaging. Twitter for Android tends to load well and only occasionally stalls momentarily when loading images and Tweets, but this is contingent on the available internet connection. Twitter for Android is free and available from Google Play. I want to ask when this app will be available?? ?